I need help. Something for my face when I am running… my entire body was nice and toasty but my face was so cold yesterday. Those of you running in cold temperatures, how do you keep your face warm? Also the cold weather makes me motivated to choose the right podcast or music playlist before leaving the house because there is no way I’m taking off my gloves during the run to switch around what I’m listening to. 1.53 miles of speed wahoo! I’m not one of those people that bounces back fast after a marathon and that’s okay with me. It was a little humbling how hard these 1 minute efforts felt (10 x 1 minute fast, 2 minutes easy) compared to doing workouts 1.5 months ago that were way way way longer and harder but I’m in a new chapter after the marathon again with some new goals and I love working towards them. The usual morning activities then occurred. 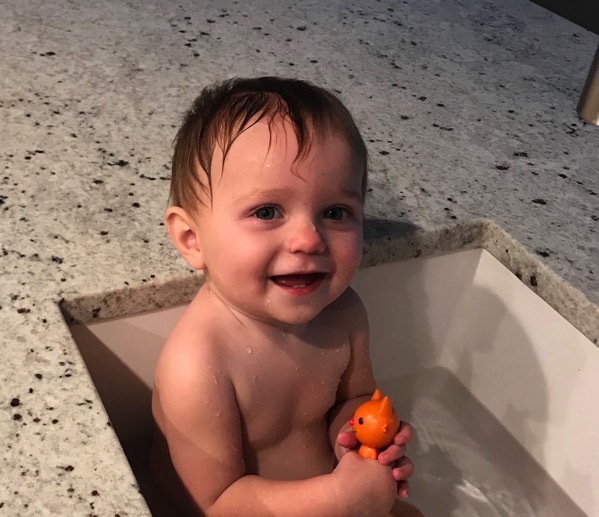 This girl is obsessed with taking baths right now. Andrew, Skye and I went to grab some lunch. This is also Skye’s current favorite salad. 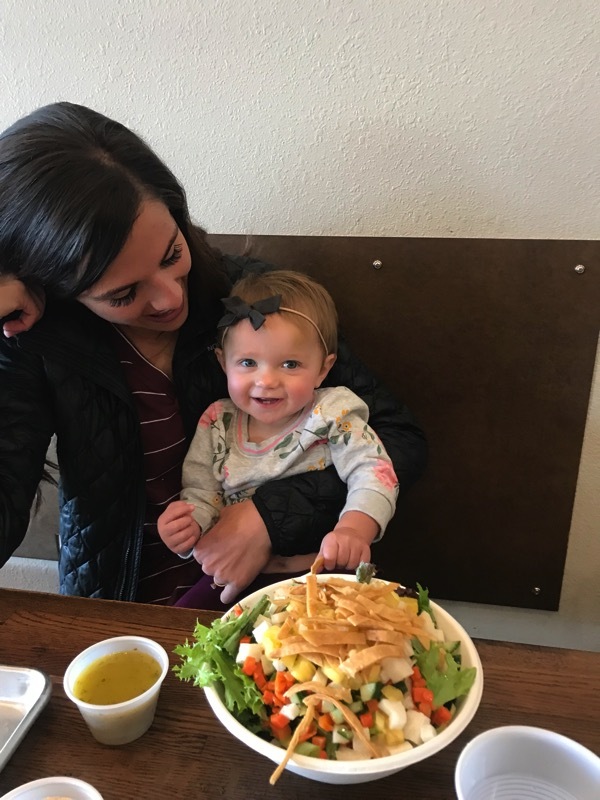 She is all about the pineapple, carrots, chicken, tortilla and tortilla strips on this bad boy… before I know it I’m going to need to order her her own. We picked up the Brookester from school. 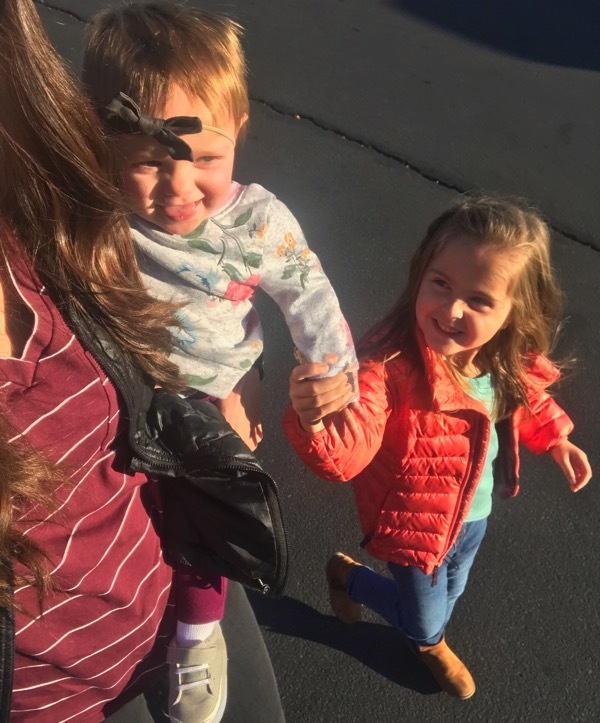 Brooke’s best friend recently moved here from a different country. Her mom was telling me how Brooke has helped her to feel so much more comfortable at school and excited to come each day. My mama heart melted when she told me this and it has been so fun getting to know her and her family. 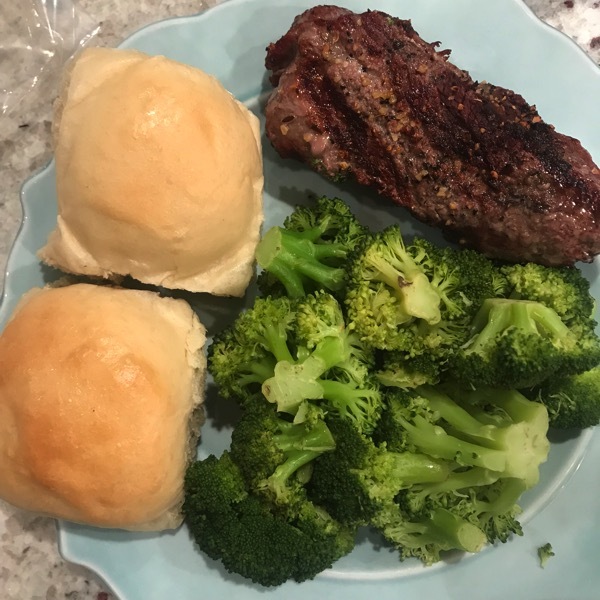 And had the most delicious steak for dinner (thank you Andrew for grilling when it is below freezing outside;). 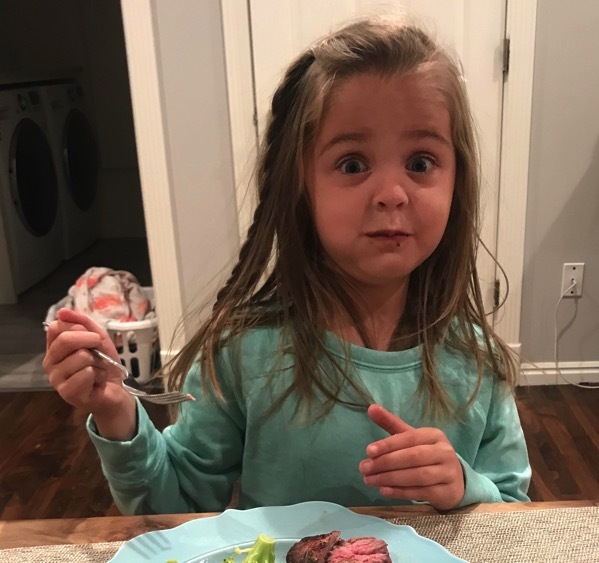 Brooke was a huge fan of the steak too. Andrew put up shiplap and I think it really added to the room. 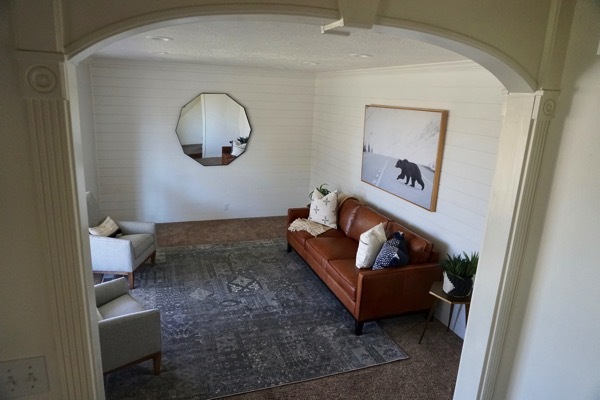 He bought primed pre-made shiplap at Burton Lumber and put it up (you can make it for cheaper but he really liked the one that he bought). He did the decorating too and I really love what he did. We are going to add a credenza under the mirror, maybe a coffee table and some greenery in the back corner but other than that, it’s all done. I did pick out the chairs and pillows so I’ll take credit for that;) Andrew likes doing his studying in this room now because it is a lot quieter, light and toy free ha which makes focusing easier. The leather couch is from Downeast and everything else is from Four Chairs Furniture. *I’ve hooked Andrew into watching A Million Little Things with me. 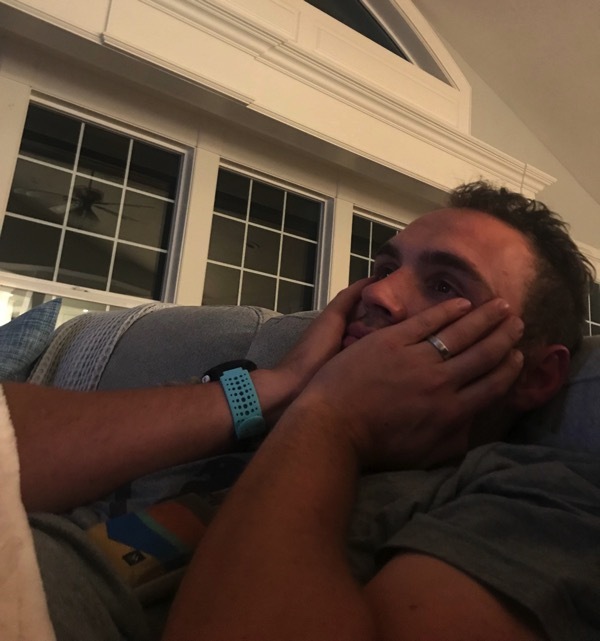 He didn’t know I was taking this picture but this is how he watched episode 3 for about 20… and yes, his eyes are teary. This show is so emotional. So it all started as your typical girl/bird relationship, in this case a cockatiel with cute little cheeks. Ha! Janae would come home from school and let Nala out of her cage. She would fly around and enjoy some freedom. I was so happy that my diversionary tactic to help Janae get over her brother leaving on a mission had worked. After a month or so I noticed when Janae would come home from school Nala would start chirping for her. Adorable, what a smart bird to try to communicate with Janae. After another month or so it turned into full out screeching when Janae would come home. Nala wouldn’t quit until Janae took her out of her cage. A few weeks later she started nipping at me when I put my hand into the cage to feed her. Didn’t really hurt so no big deal. Then she started attacking everyone, except Janae, if they came into the room when she was out. She was becoming completely obsessed and protective of Janae. How do you train/discipline a bird? They are kind of already in a 24/7 timeout. Eventually she was biting the hector out of my hand, drawing blood, when I would feed her or clean her cage. No lie, full blown Hitchcock The Birds movie if she was out of her cage. Sadly, she turned on the object of her obsession and even Janae couldn’t take her out of her cage. None of us qualified as pet bird therapists so she went back to the pet store. We have stuck to dogs since then as obviously we do not know how to handle birds! Actually I bought 2 birds, one for Janae and one for her brother, the now half marathon runner. He had a computer in his room so the bird was listening to a lot of hard drive noises. Apparently hard drives made a very distinctive sound in those days. His bird, named Bird 2000 (Bird for short) did not talk but it did make that computer sound-constantly. It’s downfall was that it teased our dog, a wonderful, obedient sheltie. I only say teased because of the way the sheltie responded to Bird. Bird would do a wolf whistle, every time the dog would walk by. It drove our dog to distraction. I think he felt degraded. Why a wolf whistle is considered bullying in the animal world I have no idea but our dog was going to get that bird. One day Bird was out of his cage and sure enough our dog came running upstairs with him in his mouth. I yelled “drop it!”. Amazingly he dropped the bird. He was way more obedient than the kids for sure. (That would not have worked if I yelled that to Janae when she had a donut in her mouth. Hahahaha!) So when Nala had to hit the road back to the pet store we packed his bags too for his own good. 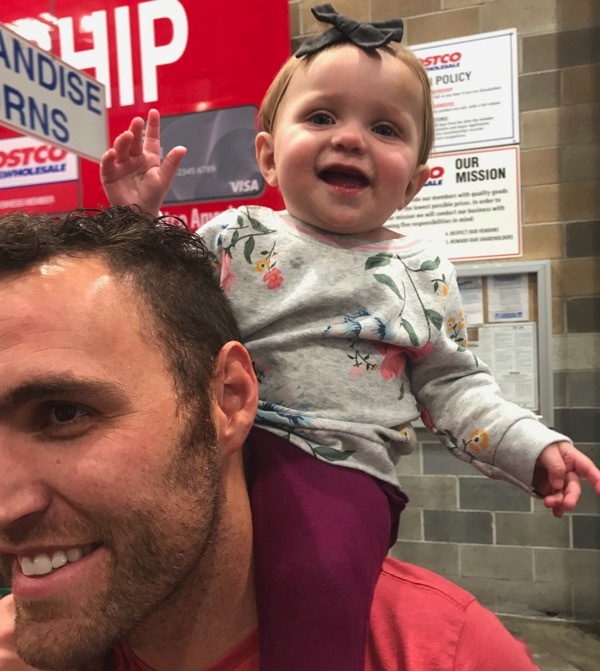 CIM is just a few weeks away… time is going by so fast! Who is going to be running it this year? What should I use to keep my face warm while running?! Question from Andrew—> What’s something on your to-do list that you are not wanting to do? What pets did you have growing up? I SIGNED UP FOR A RACE (and it’s different than anything I’ve done before). How to take the turns in a race… and back to the blades. HEY JANAE! It has been FOREVER since I’ve checked in because life has been CRAZY! I RAN MY MARATHON ON SATURDAY, the Richmond, VA, Marathon! Big goals were to make it to the starting line healthy and to BQ. DONE AND DONE!!!!!!!! The race had its challenges though. The race started out PERFECT. 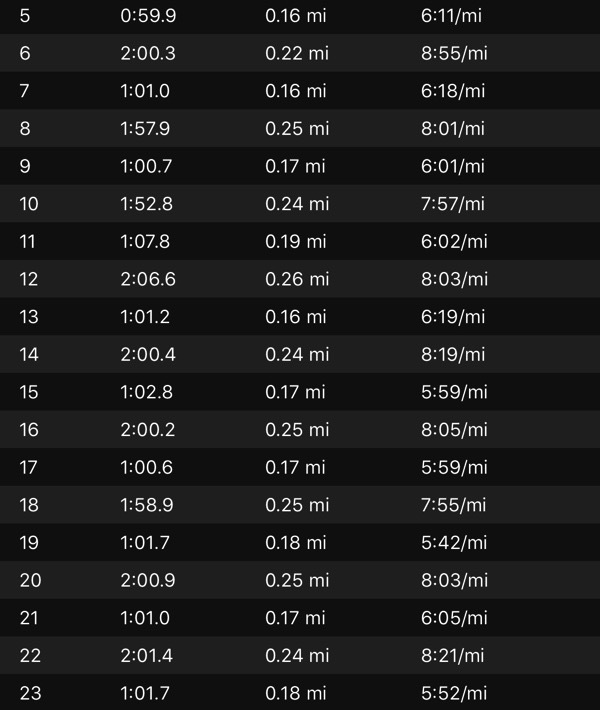 I was clipping along miles at exactly the paces my coach prescribed. I was expecting Lee Bridge to be CRAZY windy, but the wind didn’t really get bad until we were about 3/4 of the way over it. But then trouble struck—GI distress in the manner that I HAD to make a porta potty stop. HAD TO. around mile 16. I asked myself, does my race fall apart here?! I got in, got out as quickly as I could and ran hard to stay in the game, but hopefully not too hard to burn out. I’m trekking along until like mile 20 and NEEDED to go again. THANK GOODNESS porta potties showed up, and I made another pit stop. 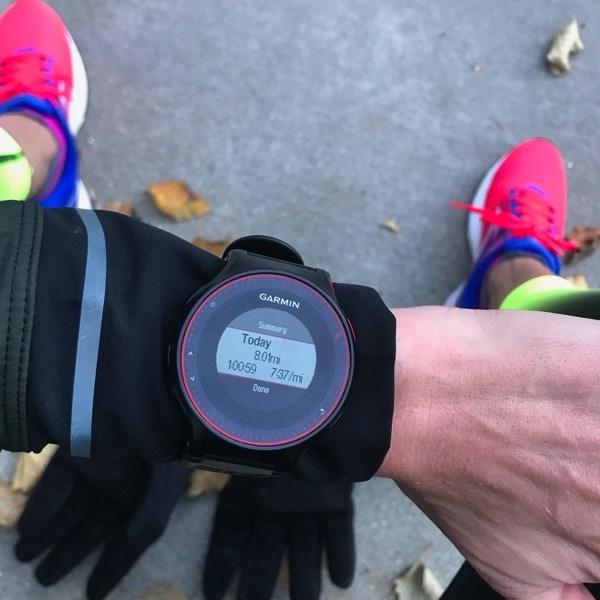 Once again, I fought to keep my overall pace in the game (I am so glad my coach had me change my watch to show lap split and overall pace average; that was a game changer for me to feel like I could still do this). Okay, then around mile 23 the 3:50 pacer passed me (I needed 3:50 to BQ), and I was like, “OH NO YOU DON’T!!!! !” and I fought to stay ahead of him. The end of that race is all downhill, and I flew down it to a 3:48:46, and a BQ!!!!!! I only have a 1:14 cushion to actually get in to Boston, but hopefully/maybe with the new tougher standard that went into effect for next year, just maybe I’ll squeak in. I could be all stressed out over that, and I have had moments of that, but geez, it’s almost a year away to even apply. The greater things to take away from this race were that I maintained even splits even with GI distress and 2 pit stops and I PROVED TO MYSELF THAT I CAN STAY MENTALLY TOUGH AND DIG DEEP DURING A RACE RATHER THAN GIVING UP!!!!!!!! And, I ran a BQ time. Whether I get in or not, how many people can say that? I’m just a runner who went after a dream, and I did it. I NEED to be so proud of that. I’VE BEEN THINKING ABOUT YOU and wondering how it went! HUGE HUGE HUGE CONGRATS! 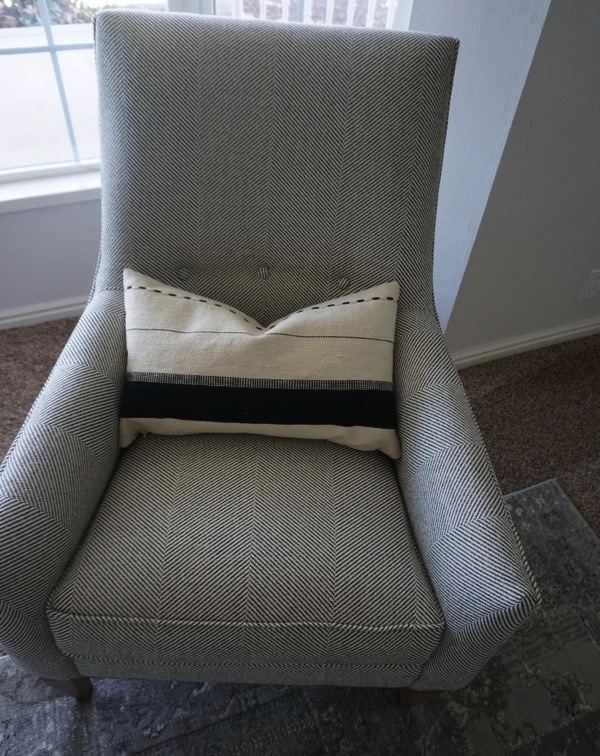 I am so incredibly happy for you and I absolutely think you will go with that cushion because of the changes. You are incredible. I have goosebumps from reading about this. You need to be proud forever about it. 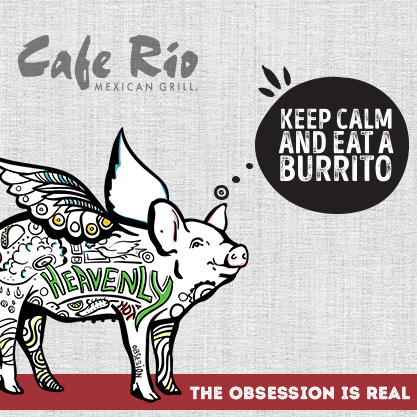 Enjoy the recovering and enjoy all of the delicious food this week:) I amazed by your strength. I use this and I live in ND it gets COLD here!! -40 with windchill, all though I won’t run went it’s that cold. We do run when it’s in the negatives. It’s nice bc you can tighten it with the draw string and there are holes so if you put it over your face you can breathe. Hi Janae! I always use a Buff (just the original, nothing fancy) when I run in the winter. It definitely keeps my face warm, still lets me breath fairly easily, and if I get too hot I just pull it down and keep it around my neck! I second this Buff recommendation! Has been my go-to in Chicago winters forever! a buff for sure, or neoprene face mask (https://www.amazon.com/Seirus-Innovation-Neofleece-Combo-Scarf/dp/B0018BGFF4?ref_=fsclp_pl_dp_2) if it’s REALLY cold! I am also 100% a BUFF girl!! I use a balaclava to keep my face warm – it’s actually pretty comfortable! I don’t keep my nose or mouth covered unless it’s just above zero, because I get annoyed by the moisture from my breathing, but even without covering my nose or mouth it keeps my neck/forehead/cheeks very warm. I have to go through comments on a 100 page technical document and definitely don’t want to deal with that hahahaha. Might be on my to-do list for a while. Hahaha yeah… yours wins the to-list avoidance:) Good luck on that hahah wish I could help you! I’m going to look up the balaclava right now. GREAT JOB THIS WEEKEND! I use a buff in winter and it helps a lot. I grew up with dogs and cats, but my dad loves anything that breaths so he always had chickens, geese and pigeons. I’ve been for x-rays and I have a stress fractor, it has been 5 weeks so there’s bone forming the dr said I must rest 2 more weeks before I run again. ps love what you did with that room, thanks for showing. OMG, I just started watching A Million Little Things, and I HAVE SO MANY FEELINGS. I’ve only watched one episode so far (I started watching yesterday), and I have a feeling I’m going to be hooked. Thankfully, I don’t deal with very cold temperatures any more (though I’m nervous about the weather when I go back there next week for Thanksgiving), but one of my buddies back home always wears a ski mask in super cold temps. It’s not as easy/comfortable for women with long hair, but you could always cut a ponytail hole in the back? Seconding and thirding the Buff for the face! Awesome! Thank you so so much Lindsey! I will be buying one! Buffs are great for keeping your face warm in the winter! I use the lightweight merino one. I like wool because it doesn’t get as gross when your breath condenses on it. The lightest weight is good if you’re going to have it over your nose and mouth, because it isn’t too thick to breath through (and you can always double it up if you want more thickness since they are really long!). The buffs are really easy to push out of the way once you start heating up and don’t want it over your face anymore. We had our first “big” snowfall today (had to break out the snow blower! ), so I’m looking forward to some snowy runs this week! Enjoy your winter running! THANK YOU FOR THE HELP ISLA… I was just wondering whether or not I should get a wool one too. 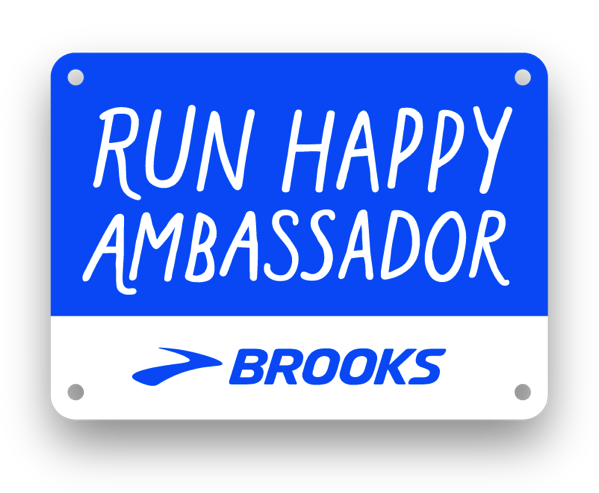 Enjoy your winter runs and the snow. Have a beautiful day! AWESOME!! I will be purchasing one. Thank you Brianna! AWESOME!! I cannot wait for it to get here. Thank you so much Melissa… I was just thinking that. It’s like $20 wahoo! Buffs, haha. Seems to be the consensus. I have an actual fear of birds—I think I always have. Even reading about them makes me cringe.😂 A stranger once put a bird on my shoulder at a restaurant without asking me. I almost called the police. And my friend pranked me in college by putting a fake bird over my door so it fell when I opened it. So scary. Lol. Needless to say, I did not have a pet bird growing up. Thank goodness! Oh my goodness…. I bet that was terrifying! Don’t worry, this will be the last bird story on my blog haha! Have a wonderful bird-free day! Another vote for Buffs here! Simple but can be worn in so many different ways. I like to wear it as a balaclava and then put my hat over it. On really cold or windy days I use a neoprene face mask that goes over my nose, mouth and chin. I think it’s designed for skiers and can get a little boogery but keeps me from getting wind burn so worth a little discomfort. When I wear the balaclava when it’s really cold, I usually putt my Buff around it to keep my neck super warm. Not because the balaclava isn’t warm enough, but I really hate cold wind blowing down into my jacket. Anything to keep the draft out! I use buffs. One product I started using last year is dermatone on exposed skin. I love it! I buy it in stick form and use it on my nose, cheeks and lips. Love the bird story! I’ve been bit by birds, chased, pecked in the head, you name it. We only have a small crew of very friendly laying hens. GREAT idea on the dermatone… I will be buying that because just today I was so annoyed by how chapped my nose felt from the cold. THANK YOU and have a wonderful day! The birds… Ha ha, but kind of scary!! 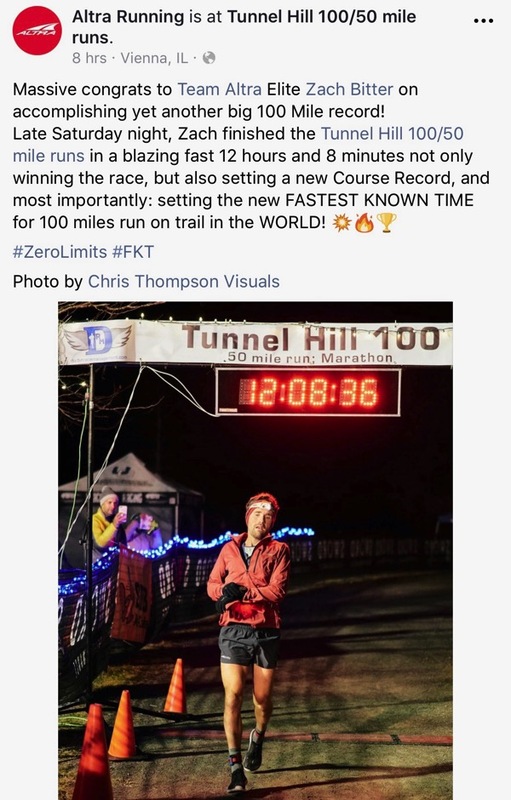 That 100 mile run is insane!! Holy moly!! The new room in your house looks so good! You and Andrew are doing a great job 😊 The light you get in your house is so warm, welcoming, and beautiful. I don’t have to worry about my face being cold for my runs, unless I’m visiting my family in Colorado! Brrrr…. I have used a scarf like thing (but much smaller) that sits on my neck and covers up and over my mouth. That bird story is my favorite. And your mom is hilarious! 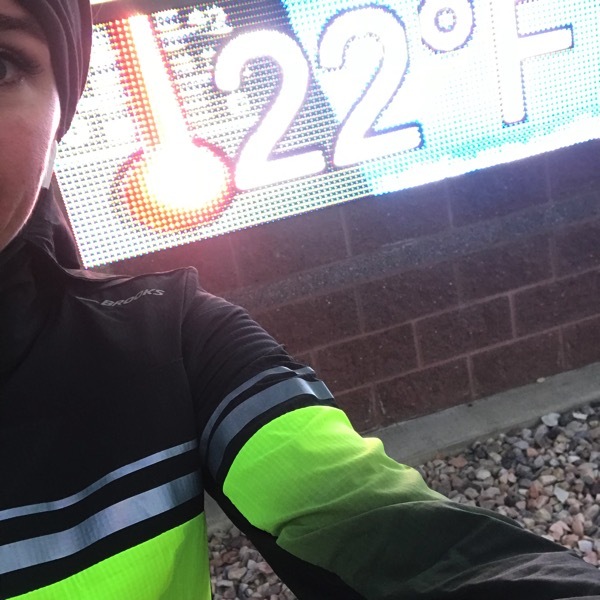 I use a Smartwool 250 weight neck gaiter and it’s AMAZING – as a MN runner, this is one of my most favorite winter running accessories. I’ve used Buffs before too in the same way, but this is much warmer and better for wind protection, plus because it’s wool, it stays warm when it gets damp (unlike synthetic fabrics). I’ve had mine for 4+ years and it still looks like new. They’re on sale at REI right now too! I have a smartwool neck gaiter as well and recommend it. I use it for running, skiing, and snowshoeing. I pull it over my nose and if I get warm, I just pull it down. it’s nice and thick, and the moisture from your nose and mouth don’t freeze compared to using a bandana. Depending on how cold it is in CT (late fall/early winter vs. January/February), I either wear a cotton scarf that I kind of wrap around my face and tie in the back or my Underarmor balaclava. The scarf is nice in the early winter because I start cold and end warm so I can just pull it down and it’s easy to breath through. The balaclava is perfect in the dead of winter and it’s extra warmth for my head. I’m def not winning any beauty contests in it but it does the job! Wow Andrew did a great job on that room, it’s gorgeous!! Thanks Tracy! I hope you have a wonderful day! Oh thank you for your sweet comment… I hope your Tuesday is a wonderful one! I use a neck gaiter that I pull up to my nose for super cold temps, that helps. The room is gorgeous, great job! 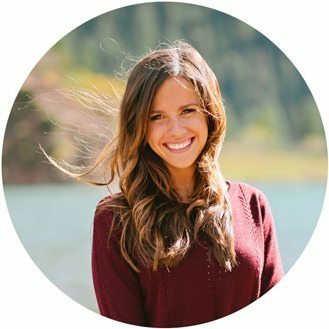 Finally->I have a personal question about amenorrhea that would require some explanation outside of what I want to put in this comment, so could I email you about that? Wear a balaclava for SURE. I had two for my winter running in Bulgaria the last 4 years (snow from October to April, NBD), and they were lifesavers. The thin ones are the best. Just having the little bit of breeze protection (plus your breath keeps your cheeks warms with just a teeny insulation). I used my thicker one on snow hikes (slower pace than running). On my to do list is selling some unneeded winter gear of nun hubby’s on eBay (his idea, not just selling his stuff for fun). But it is so much work: pictures, uploading pics to computer, writing the description, figuring out a price, and shipping, hence the procrastination. We had hamsters for our first pets (Inwas 5, my sister almost 8), but they got cooked in our van while we were at a rest stop eating lunch. After that we go a dog (a Sheltie like you!!!!) rescue from the pound, and he lived a nice long life! I thought your after picture was the inspiration picture at first! House goals! I had a beagle growing up. Beagle obsession is still going strong. Have you seen Allie Kieffer’s puggle, Winston? Obsessed. Oh thank you Molly! I LOVE HER DOG… I want one. I hope your day is a great one Molly! He also whistled the Double Mint gum commercial theme and the Andy Griffith show theme. You might be too young to remember those :) Now I’m a total dog person. Another vote for the Buff to keep your face warm. It also keeps your neck really warm…sometimes too warm for Texas winter. Andrew did a great job with the shiplap! I love seeing your new furniture. You are giving me lots of good ideas. I always use a buff/gaiter! I have a really warm one from Oiselle for bitterly cold days, and a thin one for days when it’s chilly and you need something to keep you warm in the first few miles. You can pull it up over your nose and if you get warm just pull it down around your neck, keeps your neck warm and air from going down your back too! Oh my goodness! I thought i was the only person watching that show! I cry every week! It’s so good! We need to have a group discussion about this show… it is too good! I use a UA Neck Gaiter but I don’t like how my breath makes it wet. One of my students had one that was pretty study material that unzipped to open up the mouth and nose area (but it would just pull away from your face a few inches). I thought it looked perfect! No idea where he got it or what it’s called though. I’m on a mission to figure it out. The house is coming along so well! You all have done a ton of work in a such a short time. That front room seems like it’s calling out for the piano. Maybe you’ve found a better (errr… more soundproof area) for it, but it could be so great on the wall under the mirror if it’s still looking for a home. House plants are my favorite way of making a space feel finished. They add so much life (literally) to any room. It is calling for a piano:) The problem is that we had to leave our piano at our last house (it’s a long story about when we were selling the house and what the buyers wanted…) so we need a new one! I totally agree about the house plant! Have a wonderful day Catie! Lulu Lemon has these face covers (they kind of look like smaller infinity scarves) that have little holes in them so you can put them over your nose and mouth and still breathe! I haven’t tried them but I know a lot of person who like them. I WAS JUST THERE YESTERDAY.. looks like I need to go again:) Thanks Susie! Have a wonderful day! Your house is coming together really well! I ran CIM last year, and it’s definitely one of my favs! Good luck to everyone running it this year! I had dogs and cats growing up. We have the same now plus a bearded dragon named Saphira. She is pretty cool. Hi!! I will be running CIM this year!! Any tips for the course/race day :) I know the course is rolling hills, can it still be fast??? It’s such a great course and definitely possible to run it fast. If you have a certain pace you want to run, find a pacer. Ours did such an amazing job. Oh, and call and make a reservation for dinner NOW because everywhere had a huge wait. Best of luck to you!!! Buff for your face (or I have been known to use a wide headband in a pinch). And I got these face gator things from Groupon a few years ago. They are fleece and crazy warm! My to do list item is always folding laundry- ugh, it is like never ending. I am not doing CIM, but I have my first ultra marathon on Sunday. EEK! Very interesting to read about your psycho bird! I had a bird in college that became obsessed/possessive over my boyfriend. So much so, that the bird would not let me in his cage to clean it or feed him. It got so bad he would screech over my voice when I would talk just to drown me out. But would sing, whistle, and nuzzle my boyfriend…it was like I was the other woman! When we cordially went our separate way years later he had to keep the bird because he would have starved with me he was so stubborn! I haven’t had a bird since! Dogs only! BAHAHAH ‘it was like I was the other woman!’–> That made me laugh so hard! We are right there with you at this point… dogs only! I spent my entire early adulthood in a snowy climate so I definitely experimented with cold-weather running outfits. I wholeheartedly recommend Smartwool clothing. It’s made of pure merino wool so it’s both non-itchy and incredibly warm. You can actually wash and dry their stuff in the machine without shrinking it, and because merino wool is a natural fibre it tends not to become too stinky, unlike the synthetics. They make a balaclava that is amazing, but their neckwarmers were what I typically used, pulled up over my mouth. They’re thin and light but really warm. We had every kind of small animal growing up, except a dog. Cockatiels, budgies cats, salamanders, geckos, fish, mice, hamsters, turtles. Parrots are extremely difficult to care for and often don’t do well at all in captivity — they’re very social and often bond with a single person very deeply — I can completely sympathize with your mom’s predicament because ours behaved the same way around the cat and me! In my current household we have only dogs, no other animals, so I guess I went in the opposite direction from how I grew up. No regrets — dogs are the absolute best! Thank you SO much Sara for telling me about Smartwool… would you recommend their socks too? I’d love to get their neckwarmers and socks! You guys had so many awesome animals growing up. I agree with you big time about dogs! 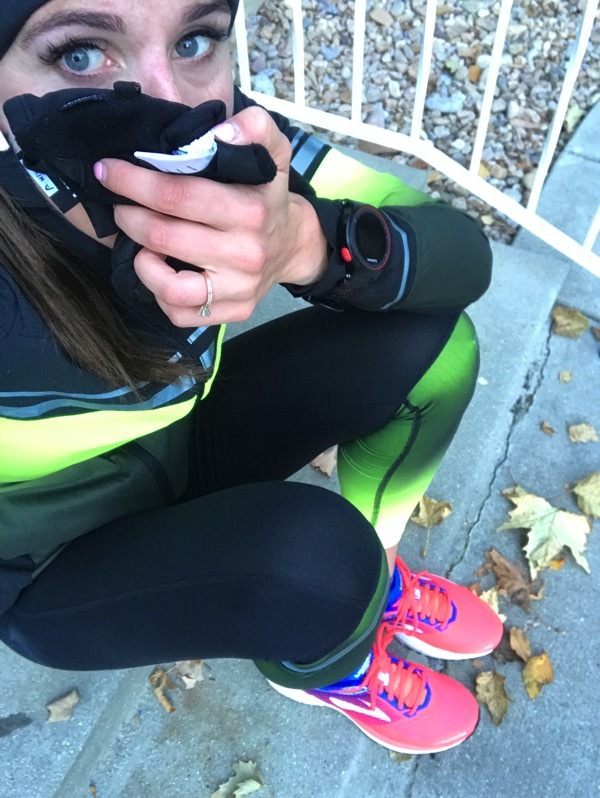 100% recommend their socks for running and also just regular cold-weather life. I got my husband and his whole family hooked! I love the heavy- and medium-thickness ones for daily use because they give my foot extra padding and support which helps with plantar fasciitis issues. Thank you so so much… just ordered a few. Have a great Tuesday! Awesome bird stories! Haa :) Thanks for making me laugh. To-do list. It’s dumb… but I hate trash pick-up day. Especially in the cold weather. The bins have to go to the end of my street b/c I live on a tiny dead end and the truck can’t make it down. So I am sitting here at work while it is pouring rain out, knowing that when I go home, I need to pull the trash bins back from the end of the street. Sometimes I combine this task with the end of my dog’s walk but it’s hard to coordinate not hitting him with the bins as I roll them along:) Haa!! You are so lucky Andrew will watch a Million Little Things with you. My man will not. It’s a great show, along with This is Us of course! Hahaha your sister sounds amazing and I love your relationship! Tell her congrats! Andrew told me that on our first date if I would have said that I wasn’t a dog person he wouldn’t have asked me out again:) He totally gets it. YES to all of the drama shows! Thank you Lisa, you too! We only had outdoor cars growing up so having a dog now I treat her like my children because I don’t know how to raise a dog lol she’s quite spoiled. Love the room good job Andrew! Love all the colors just all flows looks cozy and sleek at the same time. We have a front room that is toy free and always stays neat. It’s nice to have since our kids take over the other rooms. Hahah we only have outdoor cars too;) Your cat is so lucky to have you! 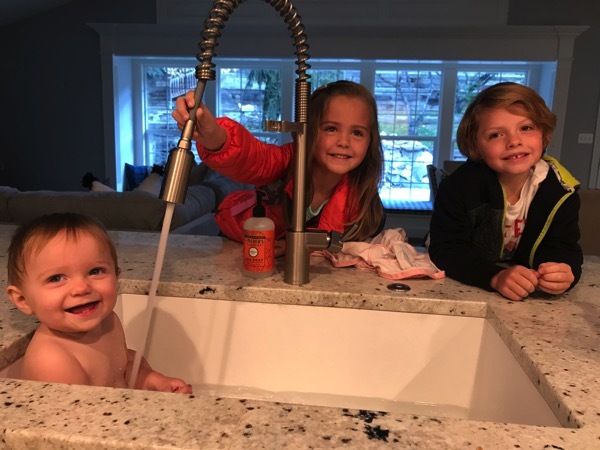 YES YES YES… it’s nice to have one spot where there is a guarantee of no toys or clutter:) Have a wonderful day Christina! I have some cold-weather face protection tips! Firstly, I cover my face with Vaseline if it’s really cold/windy out. At first I was nervous this would make my (only recently cured) acne flare up, but it didn’t and it actually left my skin super soft after:) I also have a lululemon “Cross Chill Run” neck warmer, which is breathable and light while also being super warm! It has a drawstring and little vents in the mouth area so you can fasten it up over your nose on super cold days. When it’s under 10 (I live in boston so that’s like half the time december-march) I sometimes double up with a fleece neck warmer as well. Okay, this was just what I needed… THANK YOU KERRI especially for the tip on the vaseline (I’ve been so worried about it with my acne too but my skin gets so chapped in the cold/wind. I was at lululemon yesterday… I guess I need to go back up and grab that. Thank you so much and your my inspiration to get out in the really cold temperatures. Have a wonderful day! My family got a cocker spaniel when I was in junior high. We all loved him so much. It was heart breaking when we had to put him down, but we were all able to be there so that made it a bit easier. My boyfriend just got a puppy and it makes me wish I had a dog too, until it’s time to clean up an accident. Haha now I get all the advantages (puppy kisses and belly rubs) with none of the work (vet appointments and picking up poop). Hi Janae! 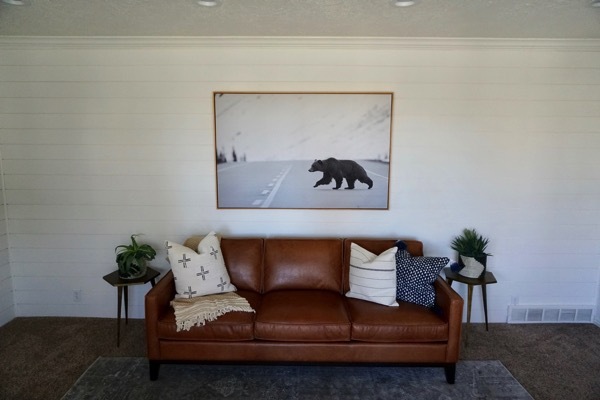 :) House looks gorgeous, I love the bear portrait and was wondering where you got it from? Thanks so much! Hey Jordan! Isn’t it cool? We got that at Four Chairs Furniture. They can call in and I’m sure they will deliver it to you! Here is there number and I hope you have a great day! 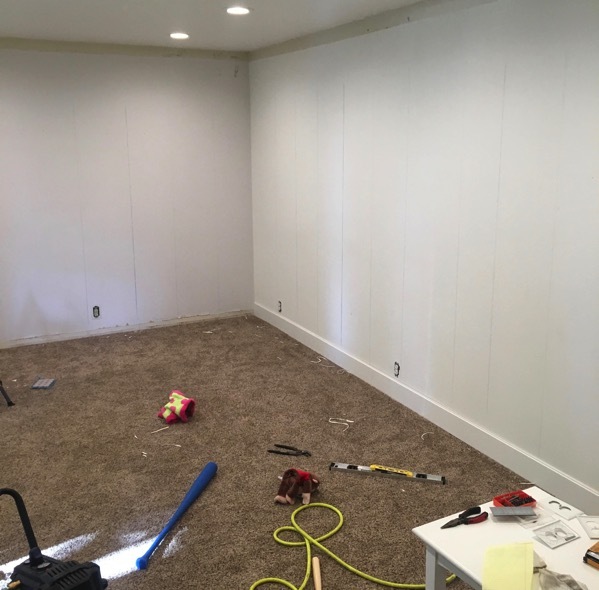 I love seeing your house remodel! Ditto on the Buff suggestions for your face. They are so versatile! They can be used all year round. For skiing we also use “neck gaiters”, so pretty much the same thing as a Buff but made of something warmer like fleece. I am glad you asked about keeping your face warm, because I need to know that as well. It’s only somewhere around 20-25 degrees here today.. WHAT IS WRONG WITH THIS WEATHER?! Coming back from warm, humid, sunny Mexico to this is not fun. Have you already signed up for races in 2019 at all? I am debating on how soon I want to sign up for things. But my spring/summer is already getting full with weddings so I suppose I have to find time to fit them in somewhere! Ok, if you two want to come over to my house and help redecorate my bedroom, you’re both hired. haha That room looks so so good! I’m so impressed. I grew up with two dogs that were 1000% part of the family and we were always told they were the favorite children. It was so rough when they passed away that it would take something really big for me to be ok getting another dog someday. The loss is just so hard but they’re so wonderful. Andrew did an amazing job on that room! I need him to come to my house for some projects! We recently moved my daughter to a different room when she got her big girl bed so now we need to redo the room she was in and it seems neither me or my husband are super motivated but we will be kid free this weekend so I am hoping we can knock it out. I like to use a running buff in the winter so I can cover my face to keep it warm and then uncover it when I start to get hot. Plus they are usually fairly tight and stay in place pretty well. Growing up I always had a cat and sometimes a dog. But I was usually more attached to the cat. Now I have 2 dogs and a cat. I think I am the only person who does not like shiplap. I think it looks like old faux wood paneling in trailers/mobile homes. However, I know a lot of people love it and it is the “in” thing now. Your house looks fabulous; perfect for your family. Enjoy! Hats and stuff on my head except for hoods give me headaches but the balaclava works though I always feel like I look as if I’m going to rob a bank! Gosh, pretty much everything on my to-do list feels like a chore though it feels good to check it off. Sometimes I’ll even add stuff after the fact to cheer me up. Two main gripes on mine are dentist and hematologist appts. plus work is burning me out so anything to do with it! Seriously, bah humbugging it lately! I would wear it with the mask down to start and once I was warmed up I was able to pull it up and leave only my hat on for warmth. Good luck getting used to those winter temps again. Now that it’s cooler here I can actually start to enjoy going outside. Andrew did an AMAZING job!!! !…..where did he find the print of the bear!!?? l love it!! Would you mind sharing the most popular suggestions for something to wear for your face during running! I’ve also been thinking this. I live in Minnesota and I use a microfleece neck gaiter when the wind chill gets under about 10 degrees. If it’s super cold you can pull it up over your mouth, cheeks, and nose; if it’s not quite as cold (or you warm up while you’re running) you can shove it down so it’s just around your neck. I also put Mary Kaye extra emollient night cream on my cheeks & forehead to prevent my skin from chapping when it’s really cold. 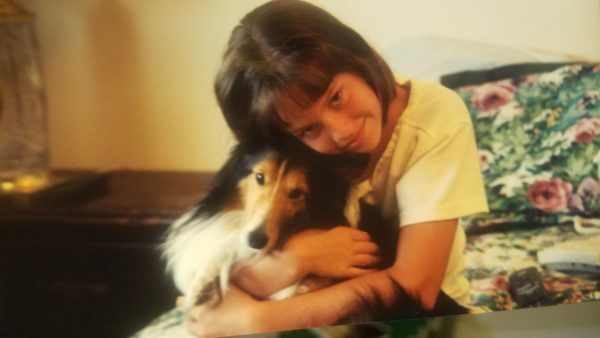 I grew up with shelties, which are the very best dogs in the world. Most of them are calm and obedient and live to please…..not my dog. We adopted her when I was 10, and she and I grew up together. That one had a mind of her own, smarts, and enough personality for 10 dogs. But she would not have dropped your bird when ordered….or done anything else that she didn’t want to do. I have a cat now, and miss having dogs. But I’ve discovered that cats are great in a completely different way, and adore my fuzzy girl. OMG – your Mom is hilarious. Reading this at work and I LOL’d for reals. Sounds like something my Mom would say too. I’m petrified of birds. I dated someone who’s parents had birds and would let them fly around the house. They thought it was HILARIOUS that the bird would come and land in my hair (because I’d get paralyzed and basically die inside from my bird issues)… needlesstostay, that relationship didn’t last. I also use a balaclava to keep my face warm…works great! I like the UA one. Not sure what show you are talking about to be honest but sounds like I need to check it out….I am all ready sucked into THIS IS US and Greys so not sure I should get into another show but oh well!